Due to a lack of support, only three entries to date, the Hope Reach Trophy and 2002T 4, scheduled to be run at Coalhouse Fort on Sunday 17th September 2017 has been cancelled. It is disappointing that the 6M skippers felt unable to support this event, especially as Coalhouse Fort RYC do not sail 6M boats and only offered to host the event to provide support to the 6M Class. 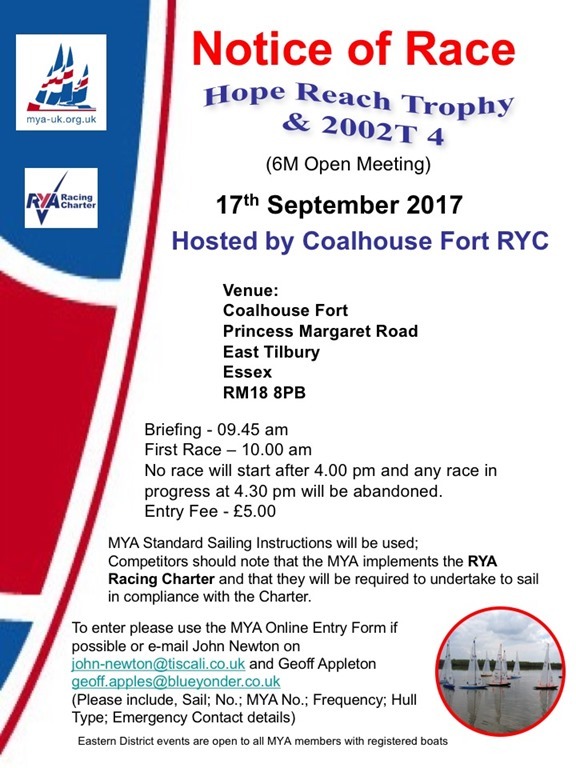 Coalhouse Fort RYC will be hosting the Hope Reach Trophy and round 4 of 2002T Championship Series on Sunday 17th September 2017 at their Coalhouse Fort, Princess Margaret Road, East Tilbury RM18 8PB venue. There will be a skippers briefing at 09:45am with the first race shortly after. No race will start after 4:00pm and any race in progress at 4:30pm will be abandoned. Competitors are reminded they will be required to sail in accordance with the RYA Racing Charter, and that they are responsible for ensuring their boat remains in class. Following the recent Sextant Trophy at Lee Valley we get the following table where Terry Burton has consolidated his position at the top. Nine skippers booked in for the Sextant Trophy at Lee Valley’s Clayton Hill venue but one was not well so could not attend. Then it was very reluctant to get going gain which seemed odd until he brought it ashore and found a large clump of weed attached to the rudder which is the only place that can catch it and usually doesn’t. So much for being non weed catching! By this time it became clear that Bernie’s Ravenna didn’t like going around the windward mark and there were many times, sometimes one after the other, when it fell just below the mark when on a starboard beat to it. However Norman Clarke’s Revulsion called Levity, got among them from time to time and took a win in Race 14. If I had then I would have seen that actually Cliff won by having 7 wins to Terry’s 4. Please be advised that, due unforeseen circumstances, the Tomlinson Vase and 2002T 2 for 6M boats, scheduled to be hosted by Harwich & Dovercourt on Sunday 2nd July 2017, has been cancelled. 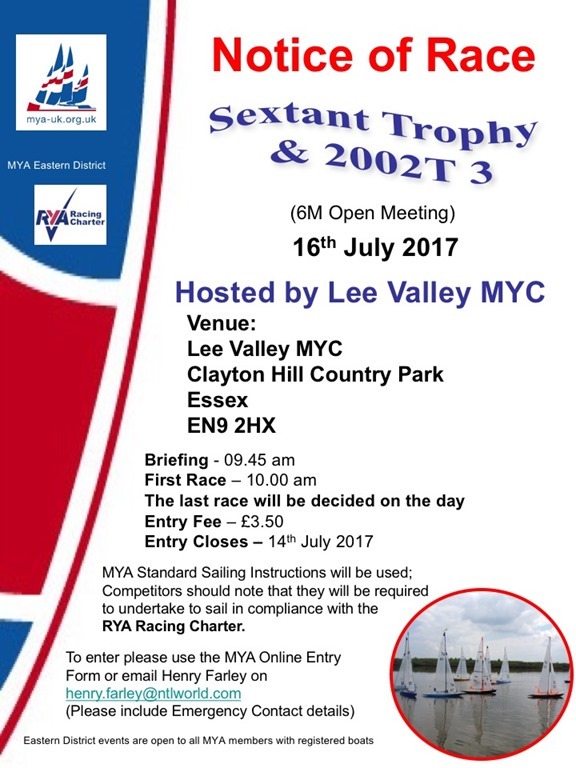 Lee Valley MYC will be hosting the Sextant Trophy and 2002T 3 on Sunday 16th July 2017 at their Clayton Hill Country Park, Lower Nazeing, Broxbourne, EN9 2HX. The event is open to all MYA members with a certified 6M boat. Please use the MYA online entry form if possible or email Henry Farley (henry.farley@ntlworld.com). Please include all details, Sail No. ; MYA No. ; Club; Hull type; Frequency and Emergency Contact name and number. Entry closes 14th July 2017. MYA Standard Sailing Instructions (SSI’s) will be used and competitors are reminded that they are required to maintain their boat in Class. Competitors should note that they will be required to sail in accordance with the RYA Racing Charter. 17 sailors from 10 different clubs and as far away as Dartmoor and Fleetwood attended the 6 Metre 2017 National Championships at Norwich Model Yacht club over the weekend of 13th/14th May 2017. Interesting fact was that there were 8 different designs taking part. As a sign of respect for Mick Shillington, who as we all know has recently passed away, and who was a great supporter and douane of the 6M class, Mick’s personal number of 28 was carried on all competing boats. He will be sadly missed in the class. Saturday morning dawned with a light SW wind which meant that PRO Vinnie Zammit had to set a starboard rounding triangular course, knowing that conditions would be tricky especially when approaching the windward mark. As there were 17 boats at the start of the competition HMS was used with 4 up 4 down promotion/relegation. The seeding races were completed and all had a taste of how fluky condition could be when the wind is in this direction. Unfortunately, this only allowed for 3 races to be completed before lunch. However, as the day went on the wind increased and went further to the west which allowed for a reasonable beat to windward. By lunchtime the fleet positions were 1st Terry Burton (winning the first 3 races), 2nd Shaun Holbeche and 3rd Bernie Guest. In fact, only 13 points covered the first 5 boats. The afternoon racing was carried out in more favourable conditions and all sailors enjoyed the sometimes-testing wind shifts, plus the occasional severe gusts which kept the spectators entertained. At the end of the day the first 2 positions were Terry and Shaun and local sailor John Hanton moving into 3rd place. Principle winners on the 1st day were, Terry (5 races ) and Shaun (3 races). This set up the Sunday rivalry between the 2 of them. That evening most of the sailors and race committee met at the local hostelry to take on some beer and buffet and put the 6M world to rights.The only thing that marred the day was one of the competitors deciding to go home without informing the Race Committee, who ended up wasting a load of time trying to find him. Sunday morning arrived with a fresher Westerly wind which slowly increased throughout the day. Unfortunately these conditions also caused some breakages and despite most sailors reducing sail area, by lunchtime the fleet had been reduced to 13 boats. These conditions seem to suit Shaun who won 3 of the 4 races that morning. That moved him in front of Terry by 2 points. John Hanton was still in 3rd. With the fleet being reduced to 13 boats, ( 2 of them held together by Cable Ties), after Lunch PRO Vinnie decided to race the boats in 1 Fleet. Only hiccup of the afternoon was race 15 which had to be abandoned due to a Dinghy sailor losing control, then charging into the sailing area and decimating a third of the fleet. Luckily no real damage was done to the boats, but their positions in the race were severely compromised after they managed to untangle themselves. With 19 races completed the RO called it a day, much to the relief of some very tired sailors. Well done to all competitors on their conduct on the water, and a big thank you to all the helpers from the Norwich club in running the event. 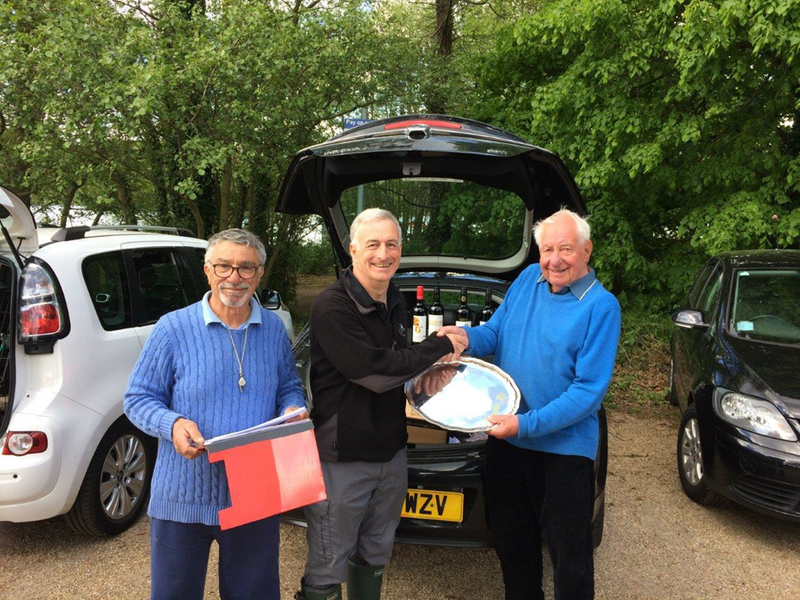 Shaun Holbeche, winner of 6M National Championship, receiving trophy from Mr Harry Ellis, chairman of NMYC and Vinnie Zammit, secretary of NMYC and Race Organiser. 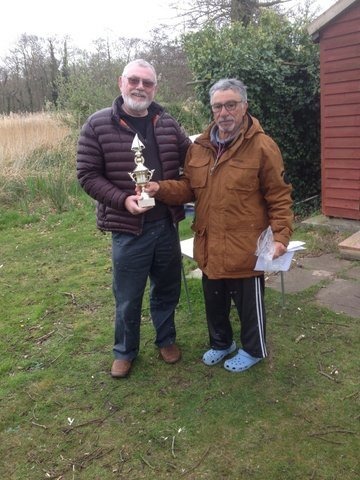 10 competitors from 4 clubs came to Filby to compete for the Shearwater trophy. Conditions were almost perfect with a NW 10 -14 knot wind. These conditions and direction are ideal for the Filby Water. This allowed The Race team of Vinnie Zammit and Tony Garner to set a windward / leeward course, which at times with shifting winds proved very testing to the fleet. Initially, Bernie Guest with his Ravenna proved difficult to beat winning the first 3 races. However Last year’s winner Terry Burton and John Hanton were hot on his heels. Also doing well was Class Captain Mike Ewart. At lunchtime these four were dominating the proceedings with Terry 1st, Bernie 2nd, Mike third and John 4th. It must be noted that Terry success was largely due to winning the last 5 races before lunch. After lunch the wind increased which made for some interesting sailing, with wind shifts causing quite a few changes in the fleet positions. Unfortunately at this stage Geoff Earl’s boat had electrical problems and decided it did not want to play anymore. Late afternoon saw the wind decreasing rapidly and with the threat of rain all competitors were relieved when the PRO called it a day after 17 races. Results at the end of the day were similar to lunchtime, Terry 1st, John 2nd Mike 3rd and Bernie 4th. Liz Browne, our only lady competitor finished with a very creditable 8th. Well done Liz. Mention must be made of the spirit in which all competitors conducted themselves during the whole event. All transgressors did their penalties without argument and with a good natured attitude. This can only bode well for the National 6 Metre Championships, which will be held at Norwich SC next month. The Broads RYC will be hosting the Shearwater Trophy and Round 1 of the 2002T Series on 16th April 2017 at their Filby Bridge Restaurant, Ormesby Little Broad, Filby, Norfolk NR29 3AA. This event is open to all MYA members with a Certified 6M boat. Please use the MYA online entry form if possible, or email Peter Sutton on peterandcheryl@virginmedia.com – please include all details, Name; Sail No. ; MYA No. ; Hull type; Frequency and Emergency Contact name and number. There will be a skippers briefing at 09.45 am with the first race shortly after at 10.00 am. No race will start after 4.00 pm and any race in progress at 4.30 pm will be abandoned.